The Speer LE Duty Ammunition Gold Dot Hollow Point .45 ACP cartridges are designed for one purpose and one purpose only, self-defense. Whether it be Law Enforcement Officers, Federal Agents, U.S. Marshalls, or a Concealed Weapon Permit holder, The Speer GDHP rounds are the ideal choice for the carry firearm on your hip. Law Enforcement Officers and Government Agents constantly train with the self-defense ammo they carry in their sidearms. It is a widely-known fact that if you want to be efficient with it, you must put in time at the range with the self-defense ammo you plan to regularly carry. All the top experts in the field of defensive shooting and self-defense agree that this is an extremely important part of your "toolbox" and should be bolstered as often as possible. 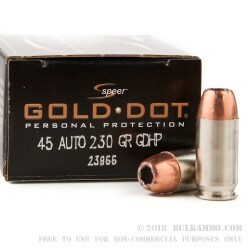 The Speer LE Gold Dot Hollow Point rounds are loaded up with the popular, heavy hitting copper jacketed, solid lead core 230 grain .45 ACP GDHP, or Gold Dot Hollow Point bullets. The GDHP's have a subsonic muzzle velocity of 890-feet per second, and 405-foot pounds of hard hitting .45-inch diameter muzzle energy. 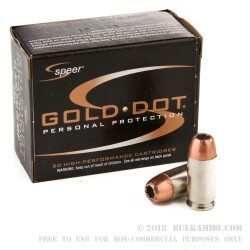 These quality Speer LE Gold Dot rounds are loaded into a thick, heavy-walled, new, reloadable, non-corrosive Boxer primed, yellow brass case. 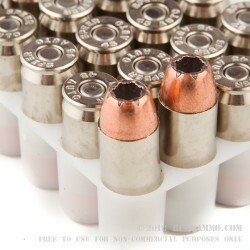 These .45 ACP loadings come in the smaller, easy to transport 20 round boxes. Whenever you want to take your family and firearms out on the range for a bit of plinking fun, these rounds are ready to join you. Get yourself a couple boxes of this top end defensive ammo today! The gold dot ammo is great. i can say that it runs like butter thru my gun. My FNP 45 will often eject spant cases into my forehead, but NOT SO WITH THESE GOLD DOTS. They eject with authority to the right and back every time. Q: Between the 230 grain and 185grain JHP which is the better option for a carry ammunition? To be more detailed, I want the most reliability in feeding coupled with accuracy. I have found GoldDot to work very well in my Colt Light Weight Commander. I know that every gun takes ammunition differently, but as a generally rule could you please assist? 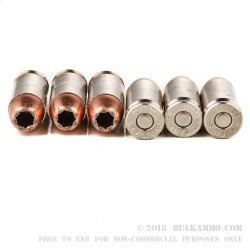 A: In .45 ACP, 230gr JHP ammunition is generally the best choice. Some of the lighter/faster hollow points tend to open up quickly and may not penetrate deep enough to reach vital organs. If your Colt functions well with 230gr Gold Dots, they would be an excellent choice for defensive ammunition.